The Point 215 Sub has been designed to complement the larger Point Series 2-way enclosures; it encompasses 2x ultra powerful 15” Kevlar Neodymium LF Drivers, giving this enclosure an output of 136.3 dB (peak), enough SPL to match multiple 12” and 15” Point Series loudspeakers. The Point 215 Sub can also be used as a stand-alone product, paired with your existing system setup to supplement missing bottom-end. Be careful though, its size is deceiving and for best results use it with Point Series tops for any live and / or playback material. Even Blues, Hip-Hop, Rock’n’Roll or Metal are no challenge for this workhorse. 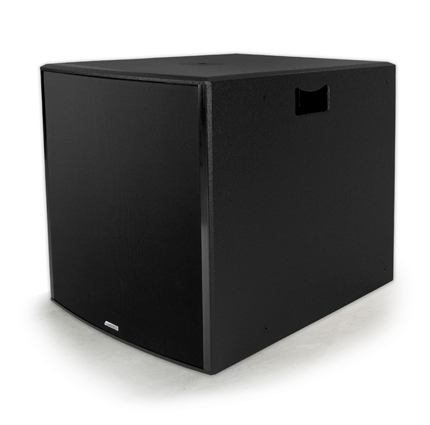 The Point 215 Sub is meant to be placed on the floor, or on stage, where it’s at its best. Should you want to array this sub, it comes with built-in 5/16 threads for eye hooks, and with an optional pole-mount base which allows SLR™ systems to attach to it via a pole-mount; otherwise this sub is rigging free.